This post is sponsored by REPREVE. All opinions expressed on my blog are 100% my own. I shared last week about Turning It Green with Repreve. I love doing my part when it comes to recycling and purchasing items made from recycled products. In our household, we Turn It Green with recycling our plastic and glass bottles. I am fortunate that my husband is a talented cabinet maker and he built us an extra long drawer for our trash and bottles - so it's all in one place making it very easy to recycle. Even the kids are pro's at recycling! We are quite fortunate, as well, that our grocery store has a recycling station right inside the entry door - through CLYNK . All we have to do is bag up our bottles in the green bag (that we need to purchase), add the little sticker with my account number, slide it through the door. Then a few days later, I scan my card at the CLYNK machine, and I can get a payment receipt that I can either cash in or apply toward my groceries. I hate it when Ward steals my running goodies!!! Don't tell him! I should back up here and add that in Maine, we pay a bottle deposit for all of our glass or plastic beverage bottles. Fortunately, you can take those bottles back to a recycling center and get your deposit back! I think it gives you just a bit more motivation to want to recycle. And recycling is just a good thing all around!!! I am loving that REPREVE takes bottles and turns them into products that I already LOVE! And guess what??? I have a REPREVE beanie that you can win!!! REPREVE was very kind to send me two awesome green beanies - one for me, and one for a very lucky Running With The Girls reader. Do you want your chance to win even bigger? REPREVE has a great contest going on. From January 17-31st, REPREVE is inviting you to share how you "turn it green" or how you live a more sustainable lifestyle by reusing or recycling materials. 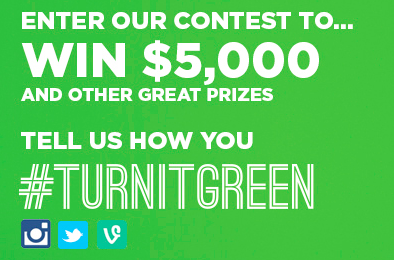 To enter, share an image or video on Twitter, Instagram or Vine with the #TurnItGreen hashtag. Once you share the image with the hashtags, you will be entered into the sweepstakes where 5 entries will be randomly selected as the Top Five. Those 5 will be voted on by the visitors to the Repreve.com site - where the image or video with the most votes will with the $5,000 cash prize. The other four "runners up" will receive a REPREVE Jacket and a Go-Pro camera (retail valued at over $350!). Voting will take place from 2/3-2/8 and the winner will be announced on 2/10. I think the Beija-Flor Jeans are gorgeous! I also like the Blue Avocado line. Those Swiftwick socks would be great for running I bet! I try to recycle as much as I can. I also try to think of alternative uses for everyday products! Thanks for being such an inspiration! Sounds like so much fun! That's crazy that the place doesn't sell tickets online or something so you don't risk not getting in! I am a big recycler, but here in Toronto we also have a Green Bin program for composting as well! Its still a work in progress, but we are getting greener! The fact that North Face is made from recycled materials is awesome! I recycle my trash that is plastic, aluminum, and paper! The jackets made out of recycled plastic look AWESOME! Wow! This is so cool. So many brands I love - Patagonia for one! This is really neat! Pick me! I recycle and never buy bottled water. Too much waste! I love Swiftwick socks! Made w/repreve! I also try to use reusable bottles and carry bags to stores. Graduation caps and gowns! So original! Such a unique think to make recycled! It's truly not easy being green!